Stockcube Research Limited ("Stockcube") is regulated in the conduct of investment business in the United Kingdom by the Financial Conduct Authority. Our services are distributed by Stockcube and are provided for information purposes only. Under no circumstances are they to be relied upon as constituting personal investment advice or construed as any offer to sell, or any solicitation of any offer to buy investments. While all reasonable care has been taken to ensure that the research information published by Stockcube is not untrue or misleading at the time of publication, neither Stockcube nor its officers or employees makes any representation or warranty as to the accuracy or completeness of such materials. No liability is accepted for any loss whether direct or indirect, incidental or consequential, arising out of any of the research materials not being true and accurate except to the extent caused by the wilful default or gross negligence of Stockcube or its employees or which arises under the United Kingdom Financial Services and Markets Act 2000. 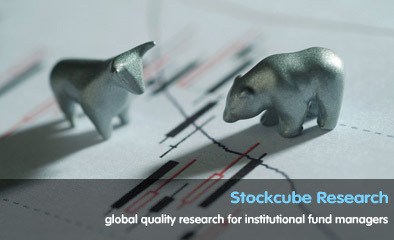 All research information on the Stockcube website is believed to be up-to-date at the time it is posted, but is subject to variation without notice. From time to time Stockcube and any of its officers or employees may, to the extent permitted by law, have a position or otherwise be interested in any transactions in investments (including derivatives) directly or indirectly the subject of our reports. Also Stockcube may from time to time provide other services (including acting as adviser) to any company mentioned in our reports. The value of shares and other investments and the income derived from them may go down as well as up, and you may not get back the full amount you originally invested. Derivatives in particular are high risk investment instruments which carry a contingent liability and the value of which may be affected by a greater proportion than the change in the value of the underlying investment or asset. If you make an investment in securities that are denominated in a currency other than your own you are warned that changes in rates of foreign exchange may have an adverse effect on the value, price or income of the investment in your own currency. Any persons in doubt as to whether the investments referred to in our research material may be suitable for them, should consult an independent financial adviser. The content of the Stockcube website is protected by copyright and other intellectual property rights or similar rights, which unless indicated otherwise are the property of Stockcube. Except for permission to download a single copy for personal use, the research information published by Stockcube may not be reproduced, distributed or published in whole or in part by any recipient for any purpose, without the prior express consent of Stockcube. Neither Stockcube nor its employees accepts any responsibility for the accuracy of any information contained within or otherwise the operation of any sites provided by third parties who at any time have links to or from Stockcube's website pages. No liability is accepted for any loss, whether direct or indirect, incidental or consequential, arising from any visit or access to such third party site or the downloading from such site of any information, materials or software. Whilst certain software may be made available to you from time to time at the Stockcube website, you are licensed to use such software on a non-exclusive basis only for the purposes specified. You are not permitted to use such software for any other purposes and may not redistribute, sell, decompile, reverse engineer, disassemble or otherwise deal with such software. The "Stockcube" name and other trade marks and logos appearing on the Stockcube website are, unless indicated otherwise, the trade marks of Stockcube. All intellectual property rights in and to the same are expressly reserved to Stockcube or (as the case may be) the organisation which has licensed Stockcube to reproduce the same and accordingly none of the trade marks may be used or reproduced by you without the express prior consent of Stockcube. Stockcube may from time to time send you promotional or other information about its products or services. In addition, Stockcube may pass your name on to carefully selected third parties who may contact you with similar or related information. If you would rather not receive the above information please either telephone Tim Parker or e-mail us in accordance with the above contact details. Access to the Stockcube website is not open to persons who are resident in or nationals of any territory outside the United Kingdom ("overseas persons") where to allow such access would require any registration, filing or other steps to be taken by Stockcube in order to comply with local laws or other regulatory requirements. It is the responsibility of overseas persons to ensure there will be no breach of any such laws or regulatory requirements by reason of their choosing to access and/or download information from the Stockcube website.